Come to the Holiday Craft Show and Green Fair in Davie this Saturday and Sunday, November 21 & 22, 2015 at the Bergeron Rodeo Grounds. Learn how to reduce your carbon footprint by utilizing “green products” that will not break your bank. 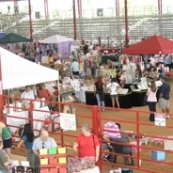 This fair is open from 9:00 a.m.- 4 p.m. The admission is free to the general public. This Green Fair and Holiday craft show will help you get a head start on your holiday shopping while doing something good for our environment. The Eco friendly businesses will teach you how to live by going green and explain the benefits for tomorrow. The Bergeron Rodeo Grounds is located at 4271 Davie Road Davie, Florida. The holiday crafts for purchase are waiting to be taken home by you! Bring your friends and family out to Davie enjoy the beautiful South Florida fall weather while strolling around outside and shopping for country crafts and traditional art. Green vendor spaces are available. Available (at a cost) for Green Businesses and Not-for Profit Green Organizations. Contact Matthew Mlodzinski, Senior Operations Manager at 954-797-1163 for more information. Think outside of the box for this holiday season and support local purveyors, reduce your carbon footprint and best yet avoid the malls!